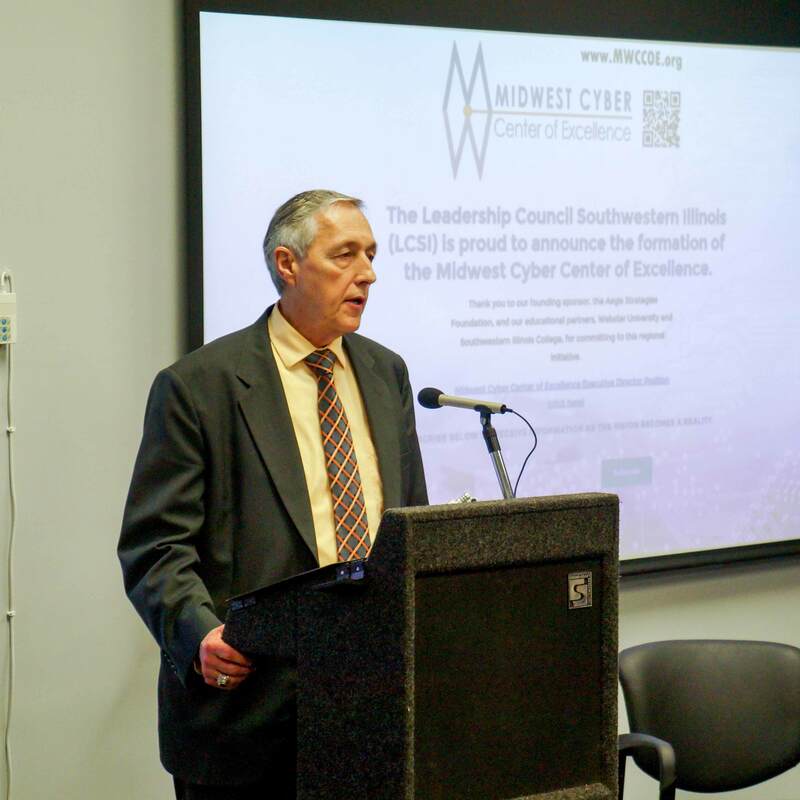 Tuesday's announcement of the launch of the Midwest Cyber Center of Excellence was covered in several regional news outlets. The new nonprofit organization has been formed to address unprecedented needs in the cybersecurity labor market being projected by local military, financial, healthcare, government and law enforcement agencies. Thomas Johnson, interim dean of the George Herbert Walker School of Business, spoke at the event and was quoted in the news coverage that followed. "Johnson said the growing need is leading to lucrative careers for cybersecurity graduates. “The starting salaries depend on the corporation and their particular needs, but it’s not at all uncommon to see $95,000 to $125,000 salaries.” he said. For young people, cyber-security remains a career field brightened by the prospect of numerous job openings and relatively high pay far into the future. "The NGA is seeking to build a billion dollar replacement facility for its current western headquarters facility near the Anheuser-Busch brewery in St. Louis. The spy agency is evaluating four sites for the project, including north St. Louis and a site near Scott Air Force Base." Chris Blask, chairman of the Industrial Control Systems Information Sharing and Analysis Center (ICS-ISAC), called yesterday's CISA vote "encouraging," noting that "it's good that we're having these conversations at the congressional level." He didn't share the privacy worries that spurred tech giants including Apple Inc. and Google to oppose CISA. "We certainly don't need to be sharing [personally identifiable information], really sensitive information like that," he said of his own center, which operates under the Webster University Cyberspace Research Institute. "A lot of the really high-value information is simply knowing that a facility of a given type had a given experience," he said, and then passing along the general outline of how that experience played out." MBA program director Debbie Psihountas and current student Denise Hassanein were quoted in an Oct. 23 St. Louis Business Journal about trends in regional MBA enrollment. Psihountas discussed demographic and economic factors affecting MBA enrollment trends. Hassanein, who returned from Washington to tend with family, explained why she chose Webster from among other programs offered in the St. Louis region.